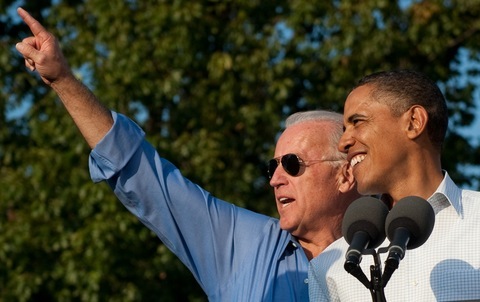 Vice President Joe Biden and President Barack Obama attend a rally in Philadelphia earlier this month. Photo by Saul Loeb/AFP/Getty Images. President Obama, currently in the midst of a Western campaign swing, will spend the final weekend of the midterm season on a four-city blitz through Philadelphia, Bridgeport, Conn., Chicago and Cleveland. All four cities are in key swing states where the White House hopes the president can lift turnout for Democrats just days before voters head to the polls. In Philadelphia on Saturday, Oct. 30, the president will participate in a canvassing kickoff event before attending “get out the vote” rallies in Bridgeport and Chicago. At the Cleveland rally on Sunday, Oct. 31, the president will be joined by Vice President Joe Biden. On Monday, Nov. 1, first lady Michelle Obama will hold two rallies of her own in Philadelphia and Las Vegas. White House Press Secretary Robert Gibbs said Wednesday the president would spend Election Day in Washington, D.C. When President George W. Bush emerged in public following the 2006 midterm elections, he declared that his party had taken a “thumpin'” and accepted Defense Secretary Donald Rumsfeld’s resignation. Four years later, the former president is once again expected to take center stage after the midterm election results are clear, but he’ll likely have far better results to tout on behalf of his party. Speaking to a finance trade association in Chicago on Thursday, Mr. Bush said he will go on a publicity tour for his memoir, “Decision Points,” but then quickly retreat to his less public, post-presidential life. Of course, Republicans are poised to have a good election night on Nov. 2 despite the fact that the American public holds the party’s brand in low regard. The diminished GOP brand is, of course, largely associated with the Bush presidency, which raises the question: Just how welcome will Bush’s be for potential Speaker of the House John Boehner, precisely at the moment the House Minority Leader may be trying to convince the country that a new Republican Party has arrived? Conversely, it might be the smartest timing of a book release in history by a former president. Mr. Bush will be able to wrap himself into a victorious Republican Party just as he is looking to rehabilitate his image and boost book sales. Jerry Brown gets to share a stage with President Obama on Friday, while Meg Whitman gets to share the stage with a fellow billionaire. Michael Bloomberg, the independent mayor of New York City, has been touring the country in support of candidates on both sides of the aisle. In California, he will back the woman who broke his record for most personal money spent on a single campaign for office. Whitman, the former CEO of eBay and current Republican gubernatorial candidate, has invested $140 million of her own money into her trailing campaign. Bloomberg continues to flirt with the idea of an independent bid for the presidency in 2012, but it’s unclear if there’s a viable path to 270 electoral votes, even with a kitty of $1 billion of his own money to pour into a potential campaign.